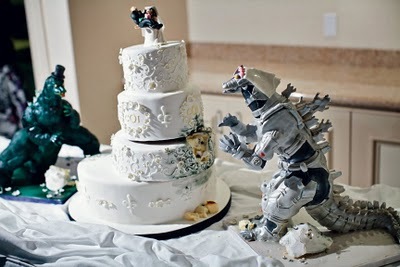 Cake Wrecks - Home - Sunday Sweets: Geek Wedding Cakes! ...is something steampunky! (Is that a word?) The gears and general awesomeness give it away. I also guarantee that when Jen and I get married again (to each other, I mean), our wedding cake will be something like this. Submitted by Jess; baker unknown. Anyone recognize it? Batman and Wonder Woman! Great colors. And I think the bottom tier is... Metropolis? Maybe? Oh yeah. PacMan and Mrs. PacMan! I missed a lot of my childhood because of those two. And PacMan should always wear a top hat, don't you think? No clue. I see math and hearts. Is there a video game with math and hearts? No? Look, this is harder than it looks, Ok? Oh! Oh! I know this! What is that show called?!? It's on the tip of my mind. It's got Bender and... that cyclops lady... Futurama! Haha! And I've never even seen it! 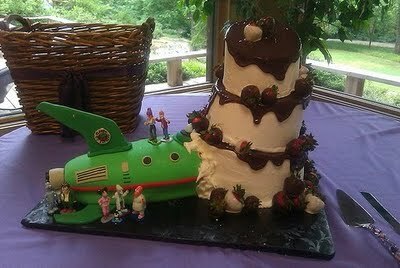 Also, that crash-landing into the cake thing is genius. Portal! Jen and I are actually playing the co-op version now. 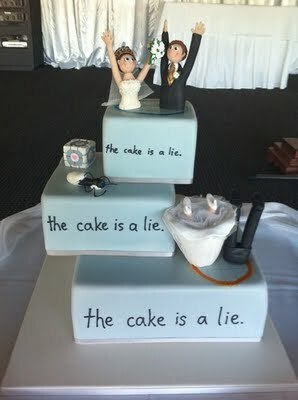 On a side note, I just realized something: If you write "The cake is a lie" on a cake, isn't that statement itself a lie? Technically, the lie is a lie since the cake is a cake. Aaand now my brain hurts. And also a... transformer version of Godzilla? Ya know, I just realized: I've never seen Godzilla. So Transformer Mrs. Godzilla could totally be in there. Huh. Aaaamazing. Especially when you realize that the 'Zillas are edible. 'Cuz, oh yes, they are. 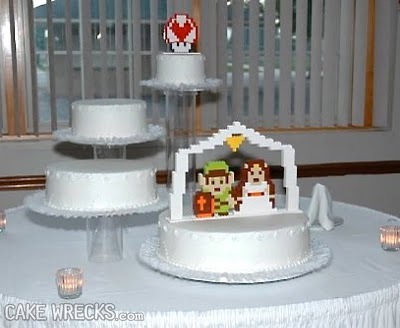 Well, I hope you enjoyed these geeky wedding Sweets, everyone. And if you have a Sweet of your own you'd like to share, please send it to Sunday Sweets (at) Cake Wrecks (dot) com. Oh, and have a great Sunday. XKCD cake is the best!!!!!! Thank you John, for explaining these in a way that I (a non-geek) can understand. My daughter is still asleep and, as gifted as she is, could not decipher them for me. 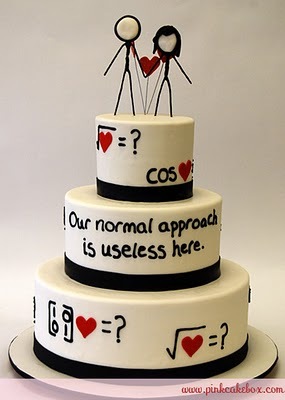 She will absolutely want that "math and hearts" cake for her wedding. Or maybe her sweet sixteen. June 26, 2011 | Sabriam - www.edenslittleones. I am married to a monster movie expert -- the transformer Godzilla is actually Mechagodzilla, who battled the real Godzilla is a knock-down drag-out destroy Tokyo brawl. At any rate, it's a brilliant cake! I'd say you did a great job guest hosting, John! Personally I've never played a video game for long before getting the irresistible urge to stop and check my email. I hope someone can translate the hearts and math cake for us, because while I'm not all that good at it myself, I appreciate an ordinary sentence expressed in computer language. That xkcd cake is purely amazing! I believe the bottom tier of the Wonder Woman/ Batman cake is actually Union Terminal, located in Cincinnati, OH. It is now called the Cincinnati Museum Center. June 26, 2011 | Ariel S.
The bottom tier on the Batman/Wonder Woman cake it the Justice League HQ. Last seen in comics in DC. That and these cakes are great! XKCD in 3D! That may be the comic book Metropolis, but I live in the real Metropolis and I can tell you for sure that it looks nothing at all like that! xkcd cake exists. My life is complete. wv: fancyter (in best rural accent)-- Them geek cakes look too fancyter eat. "Briony said... xkcd cake exists. My life is complete." John you've done us geeks proud. Well done, thank you. Every time someone mentions the ATA gene (from Stargate: Atlantis, for those not in the know), I always picture a microscopic AT-AT running amuck and blasting the bejebus out of the pitiful human genes.... but maybe that's just me. Huh! I had no idea that Mechagodzilla was a girl! The Portal one would only be cooler if the exit portal was on the side of the cake and they were about to go flying across the room. The Portal 2 co-op levels are awesome! It's not just the things that "physically" take two people; it's the way the puzzles can be solved by brainstorming. The xkcd cake can't be translated. That's the point, there's no equation for love. 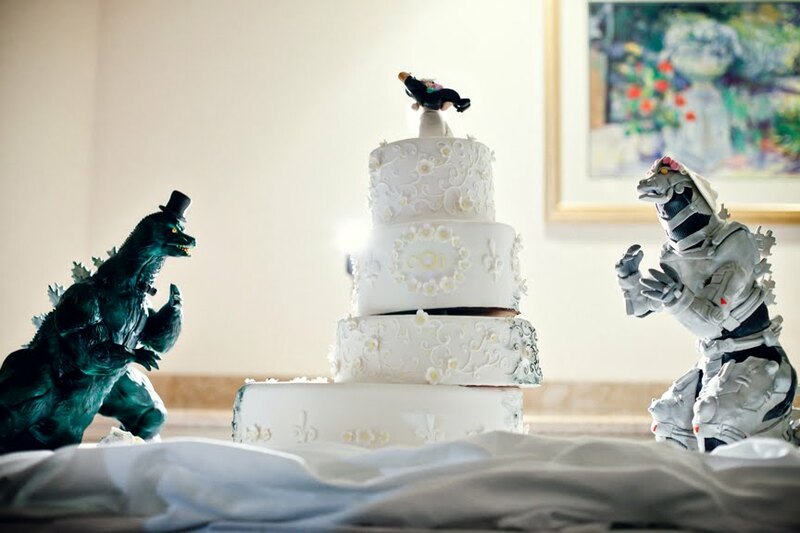 The godzillas are wearing a top hat and veil too. LOL!!! I can't believe they are edible. Great photo op of someone munching their heads off. OMG!!! 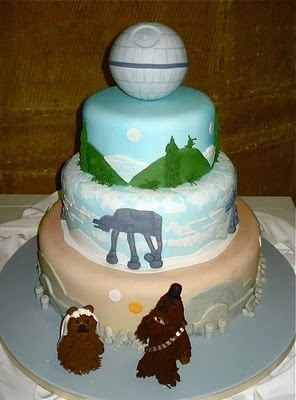 I love the star wars cake! Endor, Hoth, Tatooine, CHEWY! 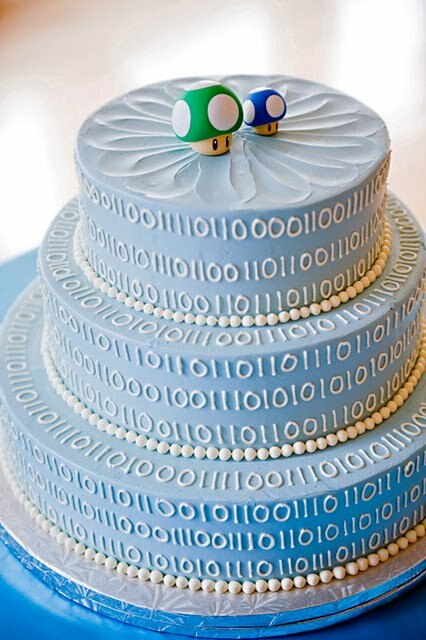 I was about to translate the binary cake, but I couldn't figure out where the numbers started. Aren't I sad? "Lego" Zelda is actually 8-bit Zelda. Its meant to have the blocky look of old style video games. Thanks for all the great geeky cakes! ...isn't that the Death Star? Isn't the steampunk cake referencing the new Alice in Wonderland movie? no? not a movie buff but something twinged my netdar when I saw it. I LOLLED when I scrolled to the XKCD cake, a shock to see! I thot I was the only one who knew about it (haha). Thanks for the Sunday giggles! Well done, john, well done. You explained everything in a way that those of us who don't know Godzilla from Alf can understand. (I never heard of steampunk until I read it on CW.) Yes, I do know Pacman. And "Star Wars", but only episodes 4-6 due to a major crush on Harrison Ford. I fail at geek. The PacMan cake is from my friend's wedding! I have many pictures of it! Wow! Great to see these creative expressions of love! I hope these couples live long and prosper. I want that XKCD cake!!! These cakes make me want to get married again, with less pressure to have all the princess-y thingie blingies. And John, you have successfully upgraded to the next level of geekdom. But, ahem, *adjusting nerd glasses*, isn't he spelled Chewie with ie? "I also guarantee that when Jen and I get married again (to each other, I mean), our wedding cake will be something like this." Huh? What? You're not married any more? When did this happen? The kxcd cake is sooo great, and i love that it is a bakery 20 min from my home!! 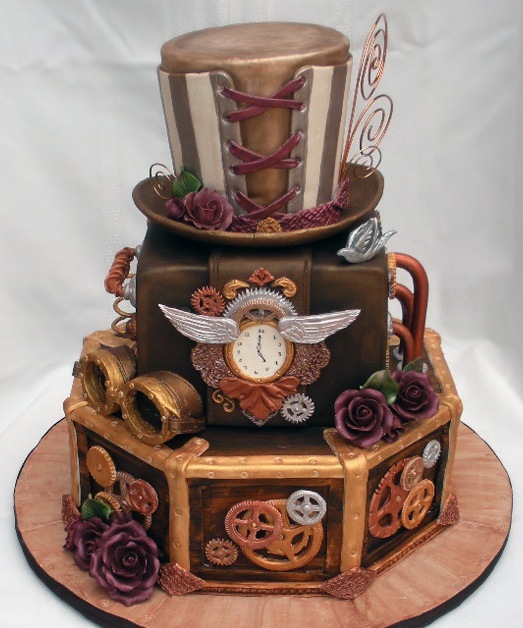 The Steampunk cake is gorgeous. What scrumptious geekiness! My faves are the the Steampunk (my hubby and I saw The Time Machine together and that would be the perfect anniversary cake) and the DC cake. Bottom tier of the DC cake features the Hall of Justice. June 26, 2011 | Melissa H.
AHHHH! 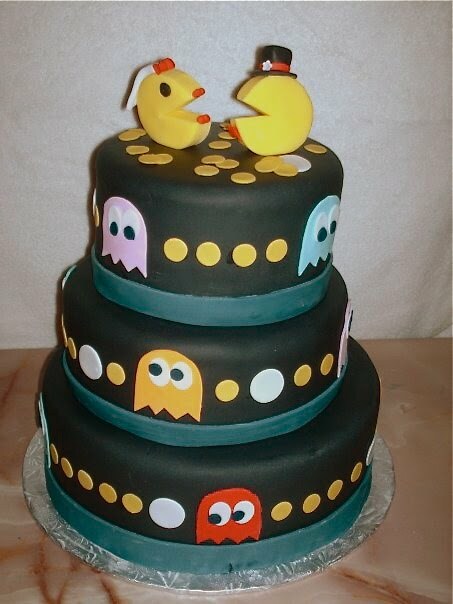 That PacMan cake is AMAZING! I see that a couple of people said this already, but I think it's hilarious that another war over a round metal shiplike objects may be starting on your blog, so I wanted to chime in to say that that is neither epcot nor spaceship earth, but the death star. Or were you kidding? Transformers Godzilla would be Mechagodzilla. My mother has probably watched every Godzilla movie there is, and therefore I have as well. John, I do enjoy when you "guest host", but I think you lost a few "geek points" in your knowledge today. You've never seen Godzilla movies?? Jen, you need to take care of that. Also the Futurama deficit. (I don't consider it a favorite show, but it can be amusing). And John, it is definitely time for you start reading XKCD comics! I'm not any kind of "geek" but I LOVE the PacMan/Ms.PacMan cake!! !